Steam distilled black pepper fruit essential oil from Madagascar. Species: Piper nigrum L. Species: Piperaceae. Class: Monopterpene. CAS: 8006-82-4. 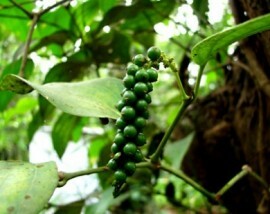 Aeracuras' black pepper essential oil from Madagascar has warm aroma, but is not so pungent as black pepper spice. Here is an article: Health Benefits of Black Pepper Essential Oil.